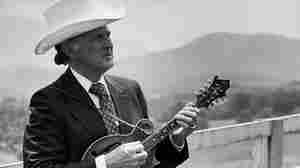 July 30, 2016  The Father of Bluegrass died 20 years ago. Now, Monroe's family is cleaning out the closets — and for music fans, even some of his most mundane possessions are meaningful. October 14, 2013  Monroe was the father of bluegrass music; the style itself was created by and named for his band The Blue Grass Boys in the late '40s. The influential musician made a 1989 visit to Mountain Stage. December 29, 2006  As part of our series about students and teachers, musicologist Bruce Nemerov describes the way that one song is recorded by several different musicians in different decades of the 20th century. The older musicians are teaching the younger musicians through the song "Sitting on Top of the World." We hear the song as recorded by Al Jolson, The Mississippi Sheiks, Howlin' Wolf, Eric Clapton, Bill Monroe and The Grateful Dead. September 12, 2011  The poor, cross-eyed boy from Kentucky created the hard-driving, high-lonesome genre known as bluegrass. 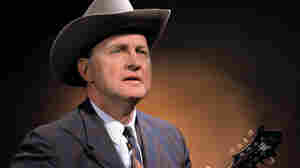 September 11, 2000  Bill Monroe first recorded Blue Moon of Kentucky in 1946, and it immediately connected with country listeners. 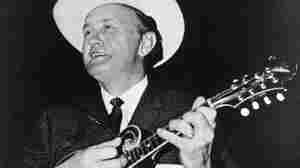 September 12, 2011  This week marks the 100th birthday of the bluegrass legend, who's credited with the genre's invention. This mix showcases Monroe's "Hillbilly Jazz" style of playing, as well as the friends and collaborators he's inspired. 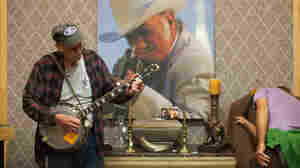 September 9, 2010  This summer, the International Bluegrass Museum's annual ROMP Festival hosted a reunion for 29 members of the legendary band. 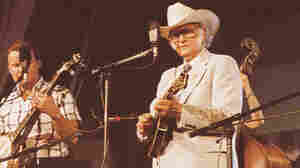 Many consider Monroe to be the "father of bluegrass," and his band included some of the best bluegrass musicians in the world.